Thirteen year old Samuel lives with his parents in a settlement on the American frontier in the 1700s. He has grown up in the woods and learned how to track and hunt animals. His parents aren't as comfortable in the woods, so Samuel provides food for his family and their neighbors. But while out on a hunt one day, his entire settlement is burned to the ground, most of the people are slaughtered and left for Samuel to find. But his parents are not there. He finds tracks that make him believe his parents have been captured, so he sets off on a journey to find them. Woods Runner by Gary Paulsen is an intense middle grade novel that gets into some gritty details about the Revolutionary War. Paulsen ends each chapter of this novel with a page of nonfiction notes about the war. Most of these notes relate in some way to the story that preceded them. I found the combination of Samuel's story and these nonfiction notes to be a great way to give a lot of detail about the war without boring young readers. I will say, though, that my son who read this said he didn't really read all of the nonfiction notes. I think he was too interested in getting back to the story. This was on my son's Battle of the Books list, so he read it at 9 years old. I honestly would recommend it for older kids. He didn't seem bothered by it, but there's a lot of violence, including descriptions of people who have been scalped and slaughtered, other people are killed in Samuel's presence, and he resorts to shooting someone in one instance. I think it's a great depiction of the horror of war, but perhaps would be better for actual middle schoolers, rather than those who are still in elementary school. 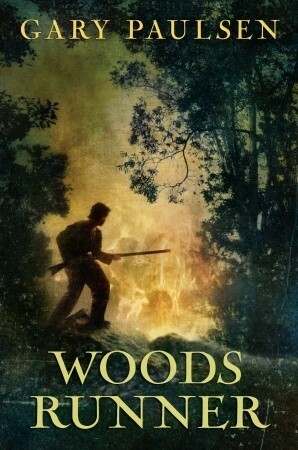 Overall, Woods Runner was an excellent book that introduces the Revolutionary War in the form of an adventure story, so I'm sure it would appeal to young readers.